New partnership with IM Properties. The Foundation have partnered with IM Properties and are delighted to launch the Peddimore Community Fund. 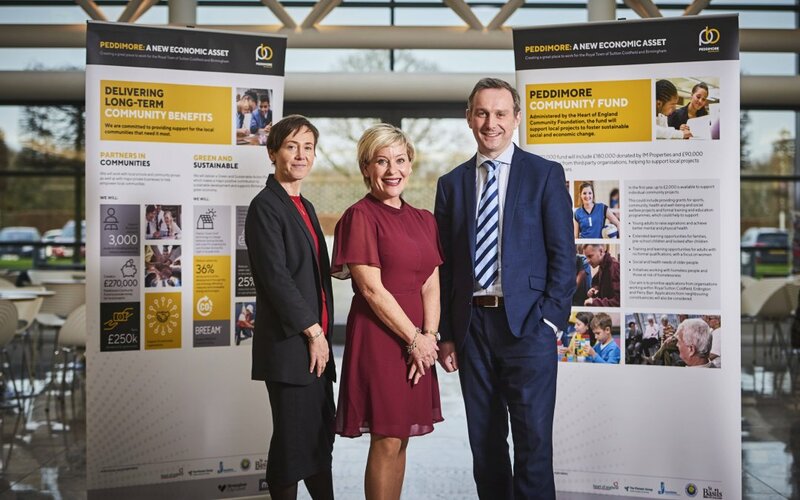 IM Properties has launched a £270,000 community fund to assist local projects surrounding the proposed Peddimore employment park. The Peddimore Community fund will be managed by the Heart of England Community Foundation, and the first set of grants of up to £2000 will be awarded on a quarterly basis during 2019, with applications now open for April. Peddimore is a major new employment park being created by IM Properties in Minworth, Royal Sutton Coldfield, to attract national and international logistic and manufacturing companies and generate up to 6,500 jobs, with 3,000 from associated supply chains. The £270,000 fund will be split over the six-year lifespan of the scheme and in the first year IM Properties will be looking to support up to 13 projects. This could include grants for sports or community projects, social welfare, health and well-being initiatives or formal training and education programmes. David Smith planning director at IM Properties said the fund was part of an extensive Social Value programme being implemented at Peddimore to deliver social and economic benefits to the local community. “We’ve said from the beginning that Peddimore is all about leaving a positive lasting legacy for the local community, and the Peddimore Community Fund is one of the many initiatives being undertaken by IM Properties to deliver real social benefits to the area, in addition to the significant job creation. IM Properties has also partnered with four community organisations as part of its Social Value agenda including St Basils, The Jericho Foundation, The Pioneer Group and Witton Lodge, with an aim to work with together to ensure individuals and communities most in need, benefit from both the social and economic value the company and its supply chain looks to deliver at Peddimore. For more information on the fund, or to apply, please click here.